Hotel gyms are unreliable at best (will it be decent, or will it be four broken treadmills and a chin-up bar?). If you stay with family, unless they have a home gym, you’re out of luck there, too. It would be great if you had a Mary Poppins-style bag that could magically hold an entire gym for you to take with you wherever you went. Unfortunately, that kind of gear is beyond even Century – but we have the next best thing! Bicep Curls (biceps) – Stand on the center of the tube, holding a handle in each hand, palms-up. Perform a curling motion, bending your arms at the elbows to bring your hands to your shoulders. Slowly lower your arms and return them to their starting position. BONUS: Hold your hands palm-down and perform the same motion for a Reverse Curl (brachialis). Bent-Over Row (back) – Stand over the center of the tube with your feet shoulder-width apart and your back and knees slightly bent. Hold a handle of the tube in each hand. Your palms should be facing inwards, towards your body. Squeeze your shoulder blades together as you draw your elbows straight back, then slowly return to the starting position. Chest Fly (chest) – Stand in a lunge with one foot back and the other forward (you don’t have to go into a low lunge – yet!). Place the middle of the band under your back foot, and hold a handle in each hand. Your hands should start slightly behind your back, with your elbows barely bent. Bring your arms in to the center of your chest in an arc, then slowly return them to the starting position. Front Arm Raises (anterior deltoids) – Hold the Sand Disc by one or both handles in one hand. Keeping your arm mostly straight (but not locked out at the elbow) raise the disc in a vertical line in front of you until you are holding it at eye level. Then slowly lower your arm to your side. Repeat the motion an equal number of times on both arms. Lateral Arm Raises (lateral deltoids) – Begin by holding the Sand Disc the same way as with the previous exercise. Instead of lifting your arm in front of you, lift it straight out to the side until the disc is slightly higher than your shoulder, then lower the disc to your starting position. Planks (core) – Lie with your stomach on the ground. Place the Sand Disc on the small of your back (or have a friend set it on for you). Keeping your back straight so as not to dislodge the sand disc, push yourself up into a plank position. Only your toes and elbows/forearms should be touching the ground. Do not allow your back to bow up or down (not only is this bad form, but it will cause the disc to shift). Hold this position for as long as desired. For decreased difficulty, lower yourself onto your knees instead of toes. Weighted Crunches (core) – Lie on your back with your knees bent and your feet on the floor. Hold the disc on your chest. Raise your upper body off the ground for one count, then return to the starting position. Standing Calf Raise (calves) – Standing up, hold the disc to your chest, or above your head for added difficulty. If you have two discs, hold one in each hand. Raise yourself up onto your tip-toes, going as high as you can, hold for one count, then lower your heels. Squats with Side-Step (quadriceps/glutes) – Loop the band around so that it forms two or three hoops (depending on the length and size of your legs, either may work, but three hoops will have a higher level of difficulty). Put the band around your ankles. Take as large a step out to the side as you can (you should feel resistance from the band) with your left leg. If you need to move your right leg in closer to the left for balance, do so, then squat. Then bring your right leg the rest of the way in, until the band is only slightly taut, and take another step out with the left, and squat. Repeat as many times with a right lead step. Make sure that at all times while you’re doing this exercises, your legs are far enough apart to keep the band taut. Otherwise, it can slip down to your feet and become a tripping hazard. 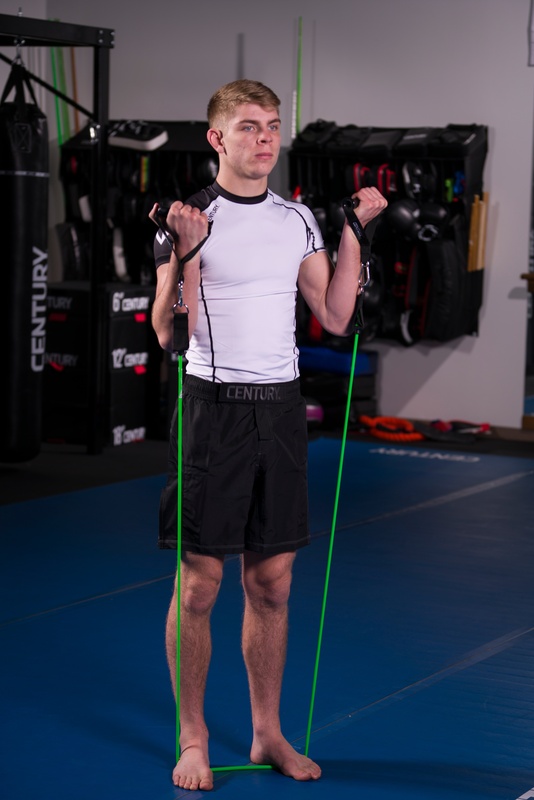 Band Pull-Apart (chest) – Hold the band in both hands, with each hand an equal distance from the center. The closer together your hands start, the harder the exercise will be. Hold your arms out in front of your chest, and slowly pull them back. The band should stretch across your chest. Once you have extended your arms as far as you are able, hold for one count, then slowly return to the starting position. Push-Ups (chest) – In the plank position, place the band across your upper back. Hold the ends of the band in either hand (you can also loop the band through your hands). Place your hands shoulder-width apart on the ground. Perform a push-up as normal – the band will provide added difficulty. You can knot one end of the band to make it shorter and increase the difficulty.